Walsine Pierce: NAVY 17 - ARMY 3: Yea, Navy! Today I thoroughly enjoyed the 110th Army-Navy game as my daughter, Kimberly, and I continued a tradition of many years standing. That Navy won, as expected, was an added bonus. One of the greatest rivalries in college football has called Philadelphia its home for the majority of its history. The fiercely competitive Army-Navy game has been played in Philadelphia for 81 of its 110 years. It is a convenient site located between the U.S. Miltary Academy in West Point, New york and the U.S. Naval Academy in Anapolis Maryland. The current series standing is remarkably even: Navy has 54 wins; Army has 49 wins, while seven games have ended in ties. Navy has now won eight games in a row, the first to achieve such a winning streak. GO NAVY! I was present when Navy last lost to Army. The game was a 70th birthday present from my three children who were at the game with me. THANKS KIDS! There is so much more to the game when seen in person. Just being present as the midshipmen march onto the field to the martial music of perhaps a dozen different musical groups gives me goose bumps. Mixed in with the Midshipmen will be about a dozen Cadets, and the same with the Army Cadets. The white hats, or black hats as the case may be, really stands out. It used to be that each college would try to steal the other teams mascots. To perserve the dignity of the animals, a goat and a mule, that practice has been abolished. Now they kidnap one anothers troops and do a prisoner exchange at half time. Then, there are the "Spirit Messages" from the troops or ships around the world. The messages can be funny or otherwise. The challenge is real! I feel it! Navy came within a hair of overcoming great odds and beating Ohio State in the season's opener. The Buckeyes squeezed out a late game 3 point victory. Most of the stastitics of that game, except the final score, favored Navy. This brings me to a personal gripe. 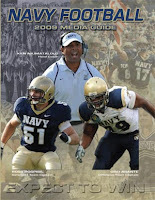 The Navy coach is paid around $485 thousand a year. The Ohio State coach is paid around $3.8 Million a year. I don't think the Ohio State coach is overpaid--the Southern Cal coach makes nearly $5 Million! Navy plays Missouri in the Texas Bowl at 3:30PM on December 31. GO NAVY! Kimberly's home is decorated for the Christmas holiday.Her 15' tree doesn't seem at all out of preportion to the room although it certainly drawfs her. The tree is decorated with 1,500 lights and 850 ornaments. Every nook and cranny of the house is filled with Christmas warmth of one sort of another. It starts in the yard and seemingly is endless. What would a game be without food? NADA! Not to worry at Kimberly's. Today it started out with different chips and dips and ended with a wonderful, hot barley-beef, vegetable soup. One thing you can always count on Kimberly to have is the best brownies in town. I had two. An important presence with Suzi and I at the Army-Navy games in recent years has been our young athlete, Riley. He kept the couch warm today. I explained how troops had to sleep in the mud and eat cold food from cans while sailors sleep in clean beds and eat hot food. He retorted, "yes, and wake up in the middle of a huricane". UMMM. What could I say? I was in four huricanes (typhoons). So much for my recruitment. Football is over for Riley and he is now playing Lacrosse. He is eleven! A VICTORY POSE? WHY NOT? We are thankful for, and pray for the safety of, all the troops standing their lonely and dangerous watches and all the sailors on ships patrolling their station around the world.